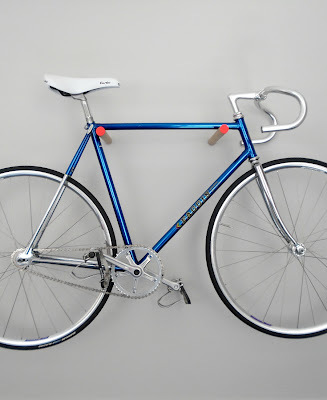 Sure, I knew I needed to exercise. I've been going to a wonderful personal trainer for years now — but just exercising with her once a week was obviously far from ideal. A gym membership didn't get me going; I wound up canceling it, so I didn't waste the money. Classes didn't work, either. Nothing seemed to get me into the exercise habit. And then I got my Fitbit - the one shown above. 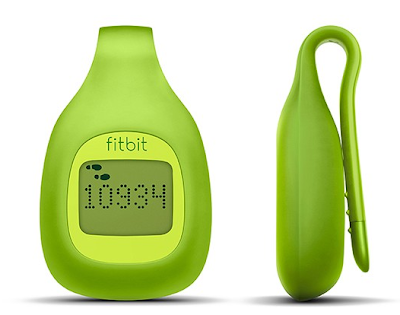 A number of women I know are using the Fitbit, and it's working well for them. They do their 10,000 or more steps per day, and are seeing the results in weight loss and overall fitness. And I figured that peer pressure (and peer support) might be just the thing to get me going. For $60, it seemed worth the gamble. And sure enough, there's something about seeing how my steps compare with everyone else's — and knowing people can see what I've done, or not done — that gets me out and walking even when I'm feeling lazy, or when it's a bit chilly, or when I have any of the many excuses I could come up with for not walking. I'm not at 10,000 steps yet, but I'm moving in the right direction. I committed to at least 6,000 steps per day this week, and I've made it every day. Today I hit my personal best, at 7,685 steps. Yes, I know that steps taken isn't a perfect measure of exercise. It doesn't capture much of what I do with my trainer, for example: lunges, crunches, squats, the stuff with the weights. But the group support has me moving every day, and that's a darn good start. Anyone else using the Fitbit and want to connect? Send me a request! How many reusable tote bags do you own? These tote bags can be really useful — even more so as cities such as San Francisco enact bag ordinances affecting the use (and cost) of the plastic and paper bags we're used to seeing. 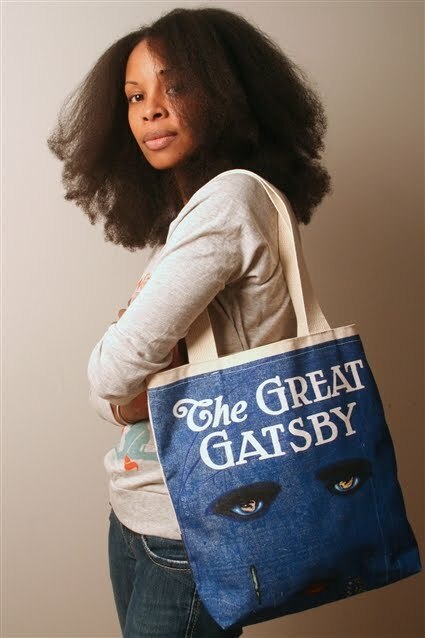 And, of course, some of the tote bags are just so appealing! 1. 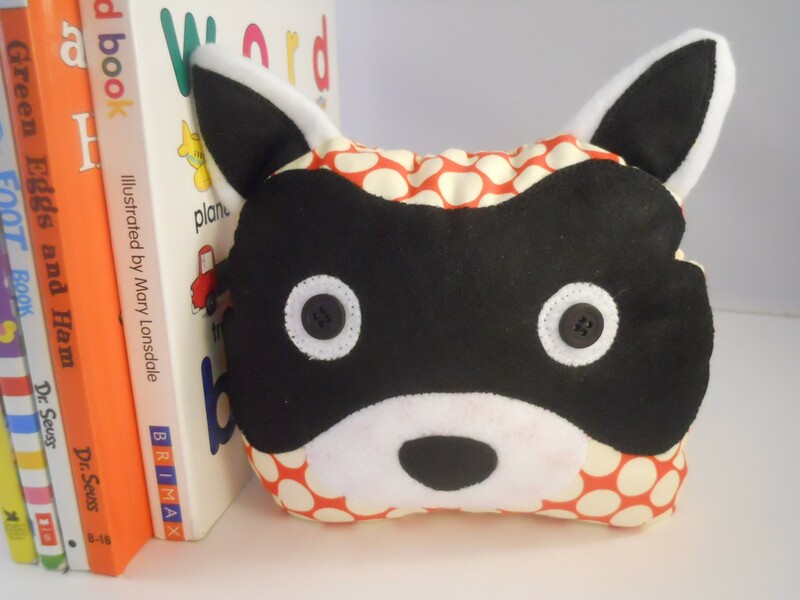 Like Tupperware and other plastic food storage containers, these bags are the type of thing where the collection can easily get way out of sync with your actual needs — so keep an eye on that. Keep your favorites, and pass along the excess. I used a cute one as a gift bag last Christmas! I found out that I probably have at least 25 reusable bags. Twenty-five! 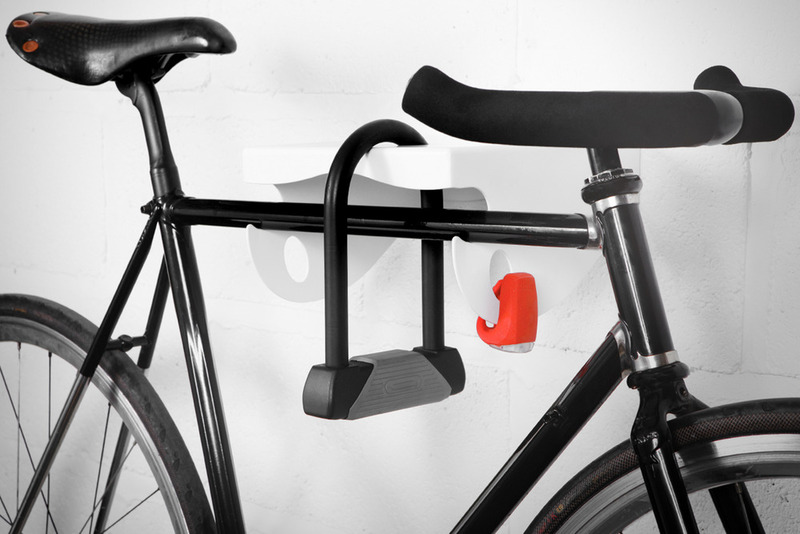 Seriously – who needs that many tote bags? Although some I have purchased, others I got for free or were given as gifts. I know that some of them I do use for groceries and some for knitting projects, and others are good to have around just in case. But I really realized that I did not need all twenty-five. So, I decided to donate a good handful of them. Recent studies ... suggest that reusable grocery bags harbor harmful bacteria, the most important of which is E. coli. If individuals fail to clean their reusable bags, these bacteria may lead to contamination of the food transported in the bags. 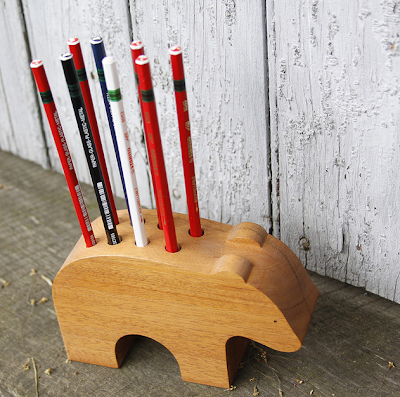 Coffee mugs make great pencil cups — but I've also found a number of other delightful options. 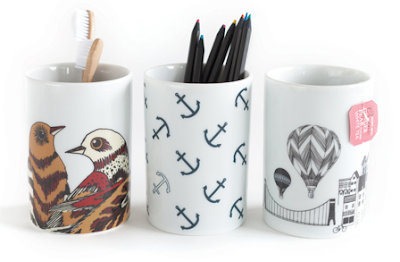 Danica Studio calls the items above "tumblers" — but See Jane Work, which carries the one with anchors and the one with a cityscape, calls them pencil cups. Funky Homes, in Australia, has the one with the cityscape and the one with the birds — and calls them bathroom tumblers. 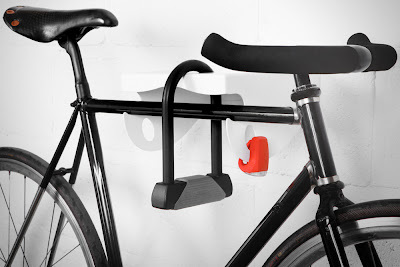 Which just shows how one item can be used many different ways! Update on Sept. 8, 2013: I'm no longer finding the bird one at Funky Homes. But I see it at LBC Modern. 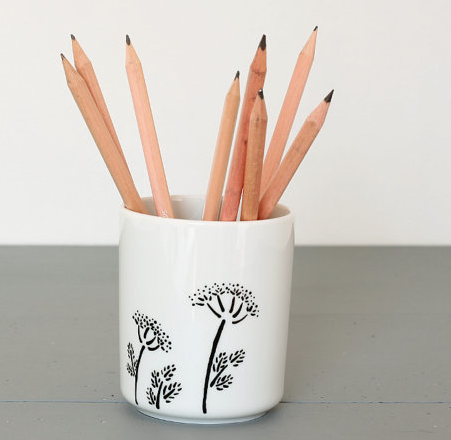 This lovely bone china pencil cup comes from Julie Lebailly of Les Miniboux — and although Julie's in Brittany, it's easy to buy from her via Etsy. 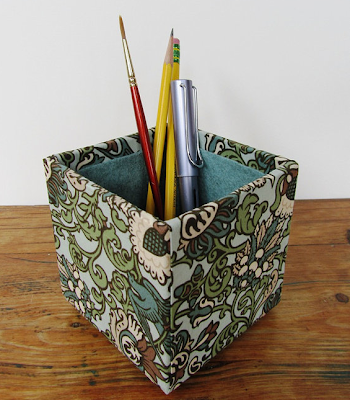 This cup also works well for storing makeup brushes, as Julie shows on her Etsy store. 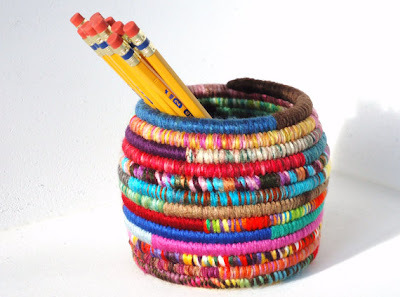 Jennifer Caldwell of JC Stars makes her pencil holders from yarns in her scrap stash. And Jessica Jones of Burnt Creative Studio makes pencil boxes using some lovely fabrics. 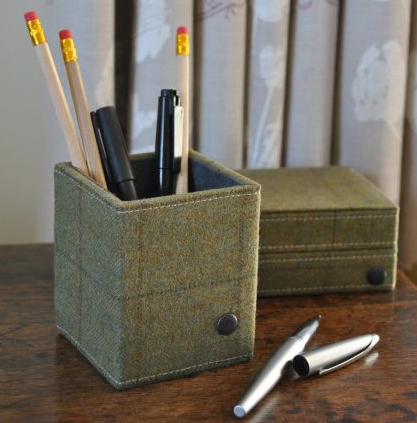 For another use of fabric, see the Tweed Pen Pot from Life of Riley. You can also buy this pot through Not on the High Street. Update on Sept. 8, 2013: This product is no longer available from Life of Riley. And then there are the animals. 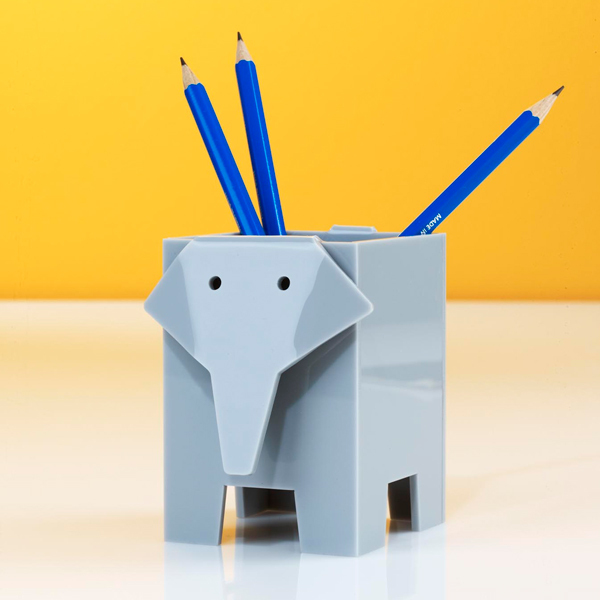 This elephant pencil cup comes from See Jane Work; it's made of shaped acrylic. OK, this one isn't a pencil cup — but it's a pencil holder, and that's close enough. 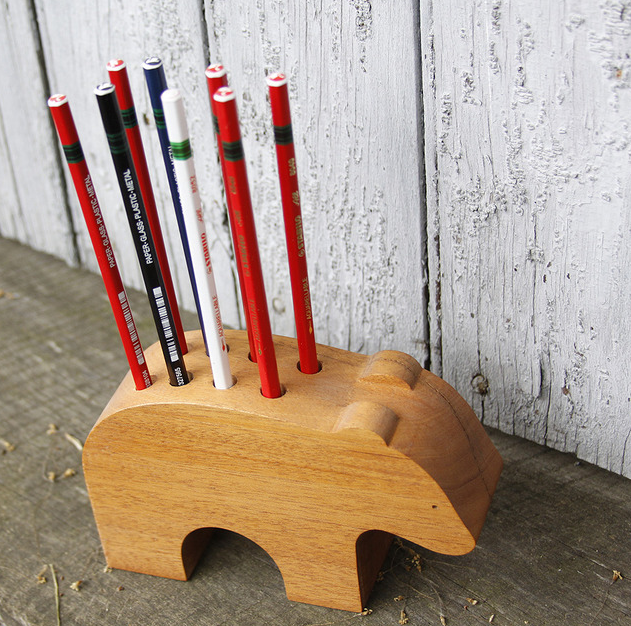 The company says this wonderful bear pencil holder is sturdy and will not fall over easily. 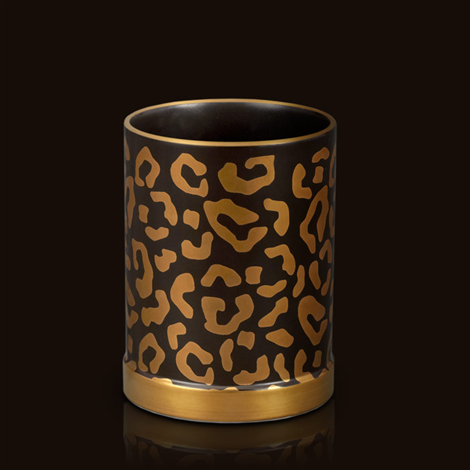 Update on Sept. 8, 2013: This product is sold out. 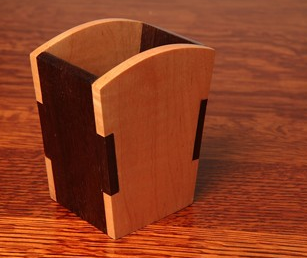 Another pencil holder made of wood comes from Timber Territory. Update on July 18, 2018: The Timber Territory website has disappeared. If you're going to keep your bicycle in a garage, there are many storage options for keeping them on the floor, the walls or the ceiling. 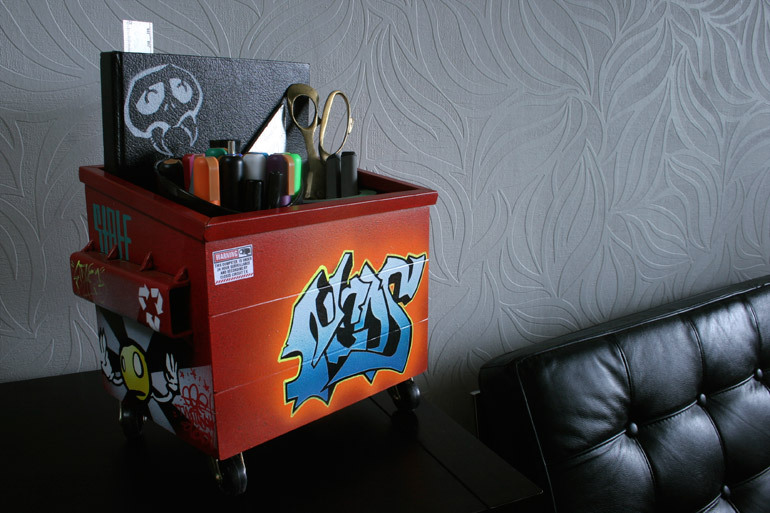 But if you plan to keep it inside your house or apartment, you may be interested in storage options that have some style. 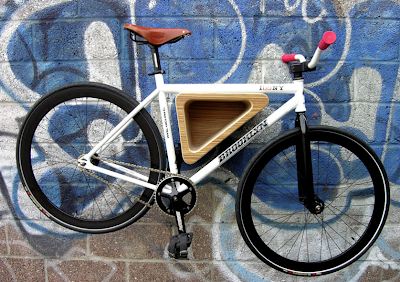 I've seen a number of products that look like minor variations on the Knife & Saw Bike Shelf, which I wrote about some in September 2010, and I'm not going to list those products here. 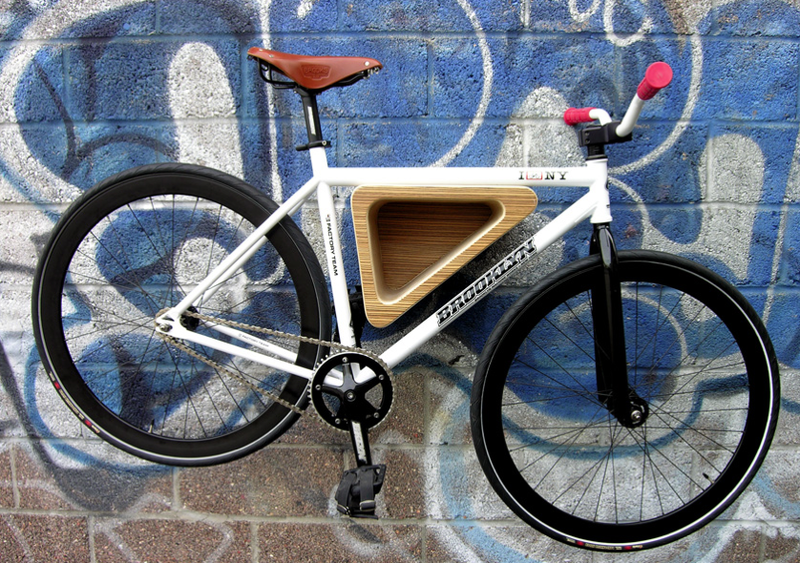 But there are a number of other products that also caught my eye. I'm an information addict. Give me a topic I'm interested in — organizing, of course, but also cats and travel destinations and education and so much more — and I have a tendency to hoard information. And a lot of that information is on the computer, so I tend to bookmark all the really good articles I read, or sites I find. To a certain degree, that's harmless — and sometimes useful. Bookmarks (or favorites, if you're using Internet Explorer) don't take up much computer space. But I recently realized how maintaining this kind of collection can easily go overboard. After the shootings at Newtown, I got a bit obsessed with learning about the issues associated with gun purchases and ownership. I wanted to understand the range of positions on gun-related issues — OK, excluding some of the most extreme views, but still including a wide range of viewpoints. So I found well-reasoned articles from people with widely differing perspectives, and read them, and learned a lot. As I read, of course, I bookmarked. And then I tried to organize those bookmarks, because the collection was getting pretty big. And then I stopped. What was I going to do with all of those bookmarks? I had considered writing a post on Google+ or someplace, but that would take a huge amount of time. And what would I accomplish? Probably very little — and I could get dragged into endless, futile debates. I realized I'd accomplished what I originally wanted; I had learned what I wanted to learn. So with a click of the mouse, I deleted all those bookmarks pointing to really good articles — but articles I would never need again. And I felt a weight lift off my shoulders. In the digital world, as well as the physical world, it helps to only file away what you might reasonably use. And for yet another variation on the basic steel bookend, take a look at these from BOOK/SHOP. 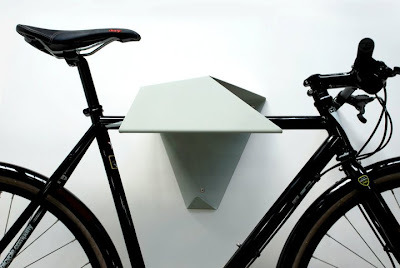 [via Better Living Through Design] Update on July 5, 2015: I'm no longer finding these at BOOK/SHOP, but the site does have another interesting choice. 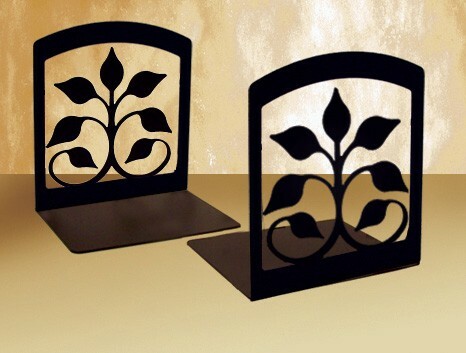 Instead of steel, you could go with wrought iron bookends. There are a number of interesting choices. 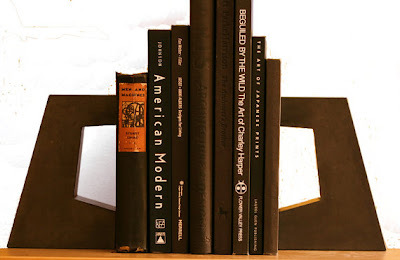 But not all heavy-duty bookends are made of metal. 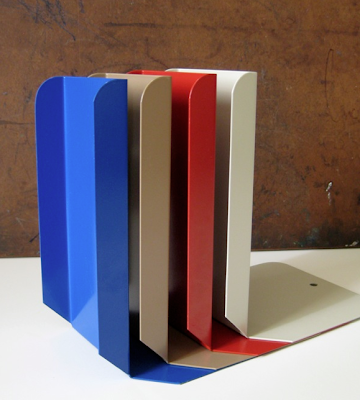 For example, Andrew Stuart makes these concrete bookends; they weight 5 pounds each. Update on April 20, 2014: I'm no longer finding these bookends. 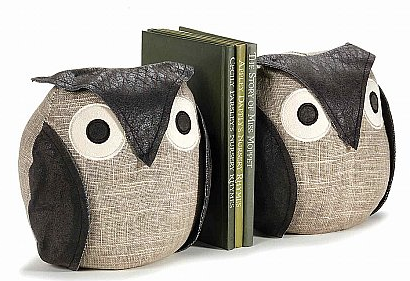 Karen makes sand-filled and rice-filled bookends, in the shape of owls, raccoons and more. And Dora Designs also makes sand-weighted bookends, including these owls. We talked about not saving every book that ever entered your home; now let's talk about not finishing every book you ever began reading. Tweet #1: I really don't understand why people joylessly slog through books they hate, even when the book in question is mine. Read something else! Tweet #2: I am merciless with books, personally. If you bore me, on to the next one. "But it picks up!" is an argument for better editing. Tweet #3: That said, there is the occasional book that I recognize something's going on and I'm just not getting it. I try some of those again later. Oh, and I walk out of bad movies too. So at least I’m consistent. 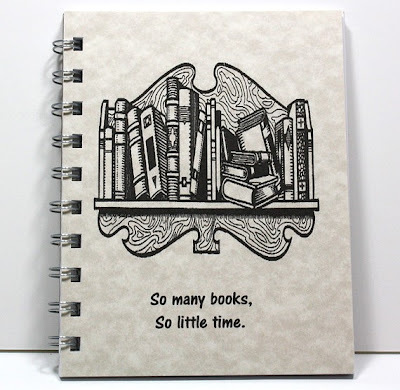 What should you do when, 20, 50 or 100 pages in, you realize you just don’t like a book? We should ask ourselves if reading a book we’re getting little out of is the best use of scarce resources. 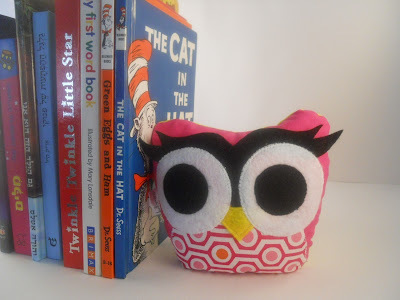 He takes his own advice, saying he finishes one book for every five to 10 he starts. I love to read, and I just don't have time to finish books that aren't doing it for me. I have a category I created just for these types of books on my Goodreads profile, since I do it so often. Like Lelah, I've learned to give up on books I don't enjoy; no way am I spending my precious time on a book I don't like — even if critics, or friends, raved about it. What about you? 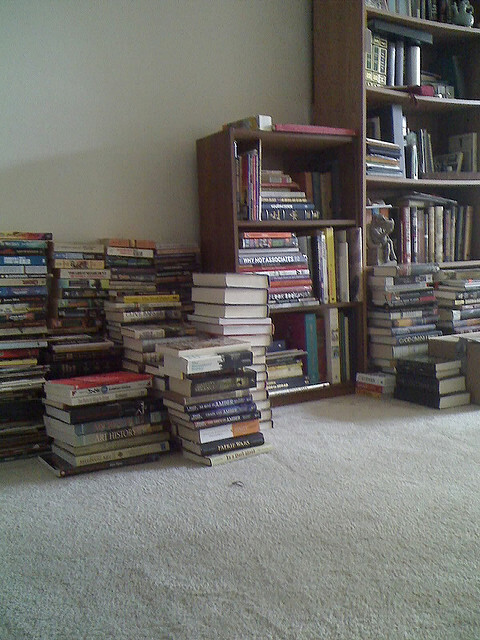 "I love my books; no way am I getting rid of any of them." I've heard that so many times, and I empathize — I love books, too. But it seems that all of us have at least some books hiding away on the bookshelves that just don't serve us any more. And if the books are hidden away in boxes, or live in piles that begin to take over your home, it might be time to do a bit of culling. If you could use a little encouragement to take a fresh look at your bookshelves — or the piles of books that don't fit on them — I've gathered some reflections from various people that might be useful. Your books are bored. Give them a new life. I don't want... to hold onto books that could bless others because I "might" read them again someday. John le Carre, "The Honourable Schoolboy." ... Of course I'm going to get rid of it. Its pages are yellow, its type is too small for me now, it smells very faintly of mildew and insect droppings. Decluttering (even more) books. No longer keeping classics. If I want to reread Middlemarch, I'll get it from the library. It all comes down to trust. Do you use it, do you love it, but — most importantly – do you trust it? The ones that I kept, are books that I trust absolutely. And, of course, some people are questioning whether apps are making cookbooks obsolete. Even if you don't think so, the easy availability of online recipes might influence what cookbooks — and how many — you want to keep. It’s time to sell your books when it’s less painful to just re-buy it on Amazon than go down to the basement and dig it out. How many ways can I sing the praises of Geralin? 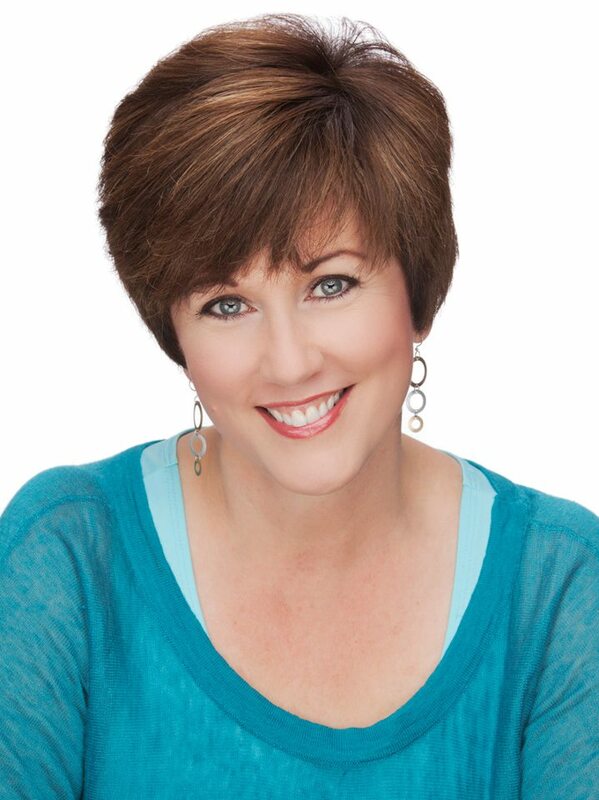 I'm so honored she's chosen to sponsor my blog; let me tell you why. I first met Geralin, in person, at a conference of the National Association of Professional Organizers, and the place was packed with hundreds of organizers. Geralin and I had said we wanted to meet, but hadn't set up a specific time. I asked around about where I might find her, and someone said I'd know her when I saw her — she's the one who looks so incredibly well put together. (And that was certainly true!) Geralin's also one of the smartest and nicest organizers in the business. If you watch Hoarders, you'll know Geralin from her work there. But what you may not know about are all the services she provides for new professional organizers, or those considering joining the field. I can't imagine a better teacher. 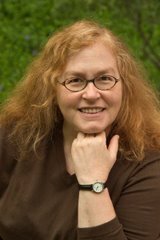 I've signed up for workshops at conferences simply because Geralin was teaching them, because I knew she'd be an excellent presenter — and with her wealth of experience I was sure to learn something. I've never been disappointed. 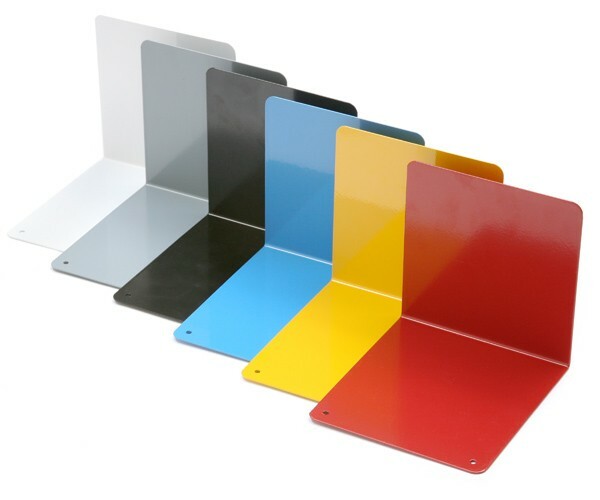 Geralin offers a range of professional organizer training services and forms. There are group teleclasses and private training sessions — and introductory classes offered by NAPO which are taught by Geralin. And then there are the many forms: a phone intake form for new clients, a photo waiver, a sample chart of accounts for doing the bookkeeping, and so much more. While many of the forms are geared to new organizers, some might have larger appeal and might also benefit the non-organizer — such as the customizable housekeeping instructions, in English and Spanish. 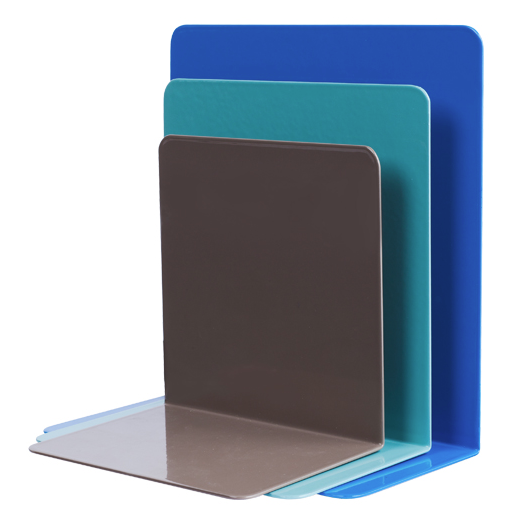 So if you're new to professional organizing, or someone considering becoming an organizer — or if you know someone who fits into either of those categories — take a look at what Geralin has to offer. Experienced organizers who feel challenged in some particular aspect of their work might want to take a look, too. 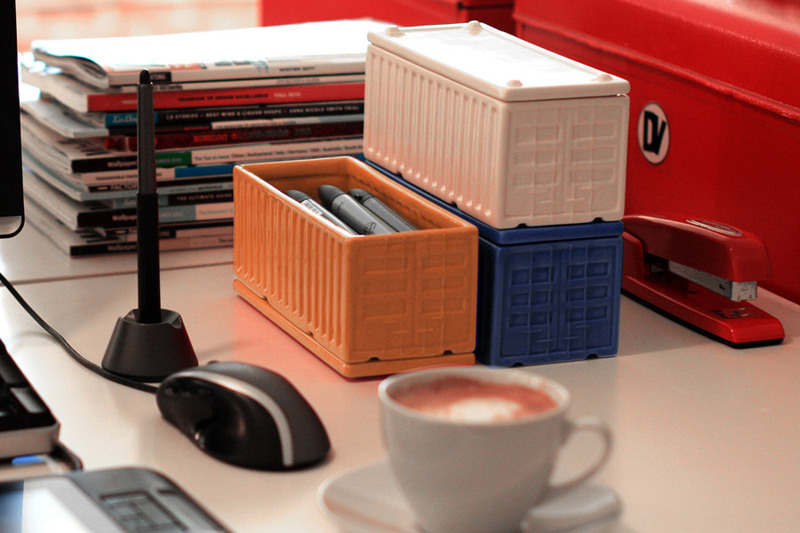 I'm also intrigued by the ceramic Cargo Containers designed by Daniel Ballou and produced by Areaware. They come in sets of two; the orange and gray are no longer available from Areaware, but you can still get the blue and white. And these are much more affordable than the dumpsters! And finally, here's a mini shopping cart! 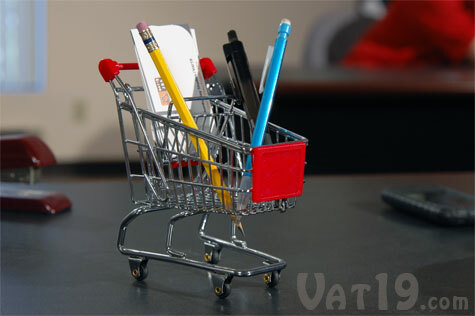 It reminds me of the shopping-cart-shaped fruit basket I mentioned in an earlier post, but it's much smaller. Over on Amazon.com, someone mentions using it to gather receipts.